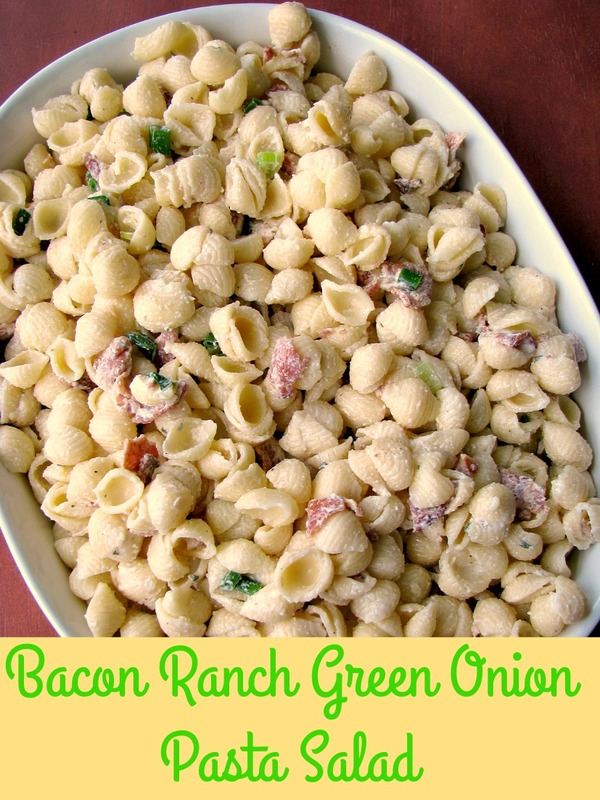 Lightly creamy Bacon Ranch Green Onion Pasta Salad, made for a crowd with just a few ingredients that can be prepared ahead. 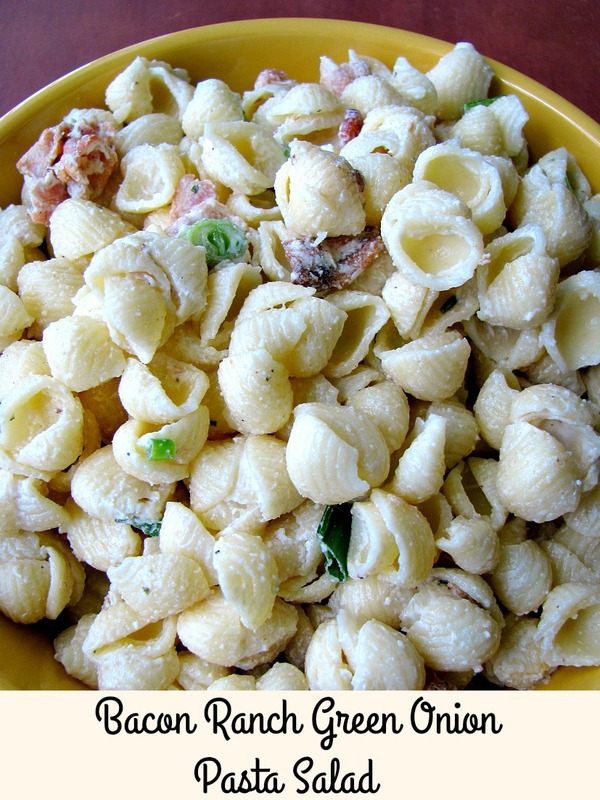 I think I found my second favorite pasta salad to make for a crowd. My first, of course, is the copycat version of Walmart’s Broccoli Cheddar Pasta Salad. 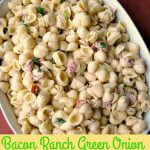 Although Bacon Ranch Green Onion Pasta Salad takes a little bit of work to cook the pasta and bacon, and chop green onions, it only has three more ingredients after that to make the creamy ranch sauce. I made this for a family friend’s high school graduation party, for 100 people. It can easily be adjusted for however many people you are expecting at your cookout or summer party. Once assembled, let the Bacon Ranch Green Onion Pasta Salad chill in the refrigerator for at least two hours before serving. Because it contains mayonnaise and sour cream it does need to stay cold. You can put the container over ice, if possible, or bring it in and refrigerate it again after two hours. The recipe as written below is enough for a 1/2 cup serving each for 100 people. Cook the pasta until tender according to package directions, drain and quickly rinse under cold water. You can do this in batches or all at once in stock pots. Cook the bacon until crispy, drain the grease and crumble. Slice the green onions thinly. In a large bowl, combine the mayonnaise, sour cream, and ranch powder; stir well. Working in separate large containers or pots, mix together the cooked and cooled pasta, crumbled bacon, and onions into equal portions. Pour an even amount of the ranch dressing mix over each batch; stir well. Cover and refrigerate until serving, at least two hours. Total time includes refrigeration time before serving. 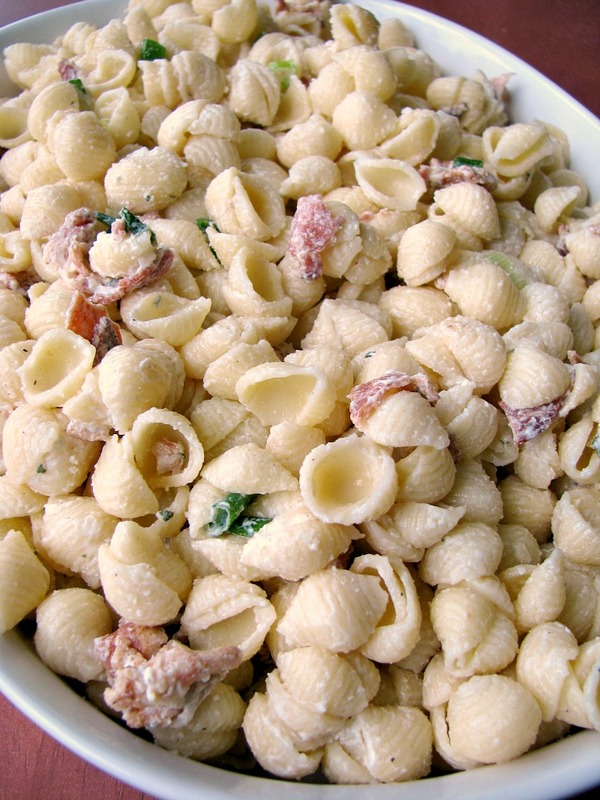 Chilled pasta salads are so perfect for summer cookouts! :] This looks delicious! May be simple but the ingredients are packing some flavor here! I love how simple this is to make for a crowd.